Come see us unveil our latest solar car, Centaurus 2! 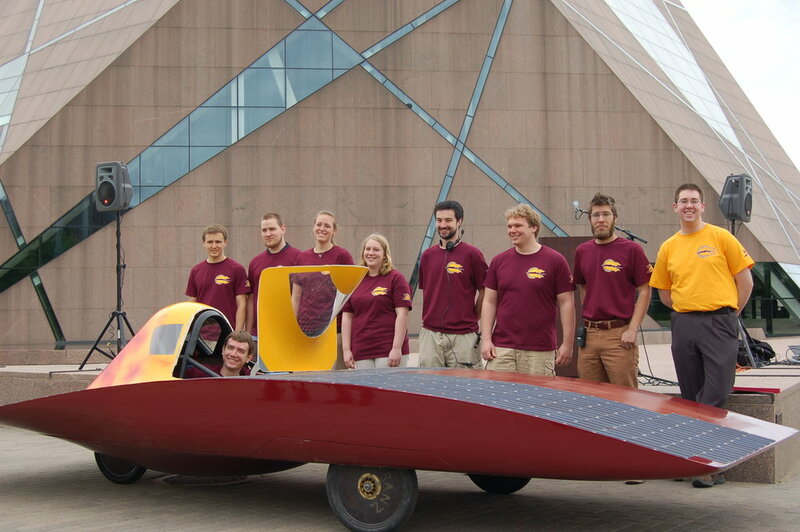 The University of Minnesota Solar Vehicle Project team will provide a sneak preview of its newest solar-powered car at a special event for the media and sponsors at 11 a.m. Thursday, May 6 on the McNamara Alumni Center Plaza, 200 Oak St. S.E., Minneapolis. Those attending will see the new car take its first test drive, view the car's inner workings and hear from members of the team about their upcoming race. This is the first public viewing of the car in preparation for the 2010 American Solar Challenge, a 1,100-mile race from Tulsa, Okla. to Chicago, Ill., June 19-27. The University of Minnesota is one of only 18 teams from the United States, Canada, Germany and Taiwan competing this year in designing, building and driving a car completely powered by the sun. The general public is invited to view the car and talk with members of the team from 2:30-4 p.m. Friday, May 7 in the courtyard east of Lind Hall, 207 Church St. S.E., Minneapolis. If raining, the car will be available for viewing under the overhang of the Electrical Engineering/Computer Science Building near the Lind Hall courtyard. 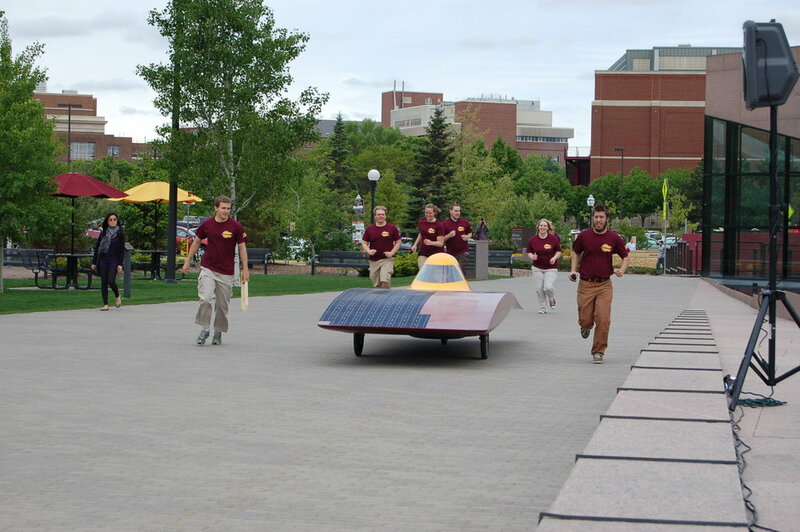 The University of Minnesota's car, named Centaurus II, is a completely new generation design from the university's previous eight solar vehicles. The most noticeable change is the new design that incorporates drastically improved aerodynamics and solar array encapsulation to maximize speed and range for the race. The current car is just over 3 feet tall, about 16 feet long and nearly 6 feet wide. It weighs about 400 pounds. The 30 students on the team are all from the Institute of Technology (soon to be called the College of Science and Engineering). Team members estimate that they've collectively spent more than 50,000 hours over the last year planning and building the solar car. Materials for the U of M's solar car were funded through cash donations and in-kind donations of parts and materials. In addition to the Institute of Technology (College of Science and Engineering), major sponsors of the University of Minnesota's solar car include 3M, Altium, Cirrus, Delta, PAR, Caterpillar, Freescale Semiconductors, General Plastics, University of Minnesota Initiative for Renewable Energy and the Environment, Programming Plus, EMJ Metals, Advance Circuits, AeroHydro, AltaMAR Laser, Finishline Design, Hexcel, Teklam, Neutrik, National Instruments, Plascore, Pro-Equipment, Sysco Asian foods, Vicor, and Wayzata Rotary Club. For more information on the history of the university's Solar Vehicle Project team and photos of the previous eight cars, visit www.svp.umn.edu.